Justice was done and the better side won, but a smash and grab could have given Latics the three points. Despite being outplayed in the first half Wigan had gone ahead courtesy of an own goal. Then in the 49th minute James Vaughan was clean through, but his heavy touch let him down. On the hour mark Latics were awarded a soft penalty as Vaughan had gone down in the box, only for the spot kick to be spooned way over the bar by Josh Windass. Windass’ miss breathed life into the home side and they equalised a minute later after another soft penalty was awarded. Given the balance of play it was no surprise when Steve Morison netted the winning goal on 82 minutes. The announcement of Paul Cook’s starting lineup an hour before kick-off raised eyebrows for some of us. Nick Powell on the bench, Callum Connolly in for Nathan Byrne and Kal Naismith for Gary Roberts. James Vaughan back in at centre forward. Once more Cook decided to play without a right winger, Connolly being brought in to presumably stiffen up the midfield. Naismith was making his first start for the club. The formation that resulted was somewhere between 4-3-3 and 4-4-2, with Vaughan and Windass operating as twin strikers and Naismith on the left. It was a far cry from the balanced 4-2-3-1 formation the manager usually employs. Wigan’s play was not a pretty sight. Latics’ best football this season has come as a result of the central midfielders dropping back to receive the ball, acting as the link between defence and attack. But last night the norm was to be long balls and hoofs. Nick Powell is Wigan’s most creative player and he has dovetailed so well with Lee Evans and Sam Morsy in midfield. But Powell was on the bench and Evans and Morsy were not at their best. Moreover, there was a lack of width with no winger on the right and Dan Burn and Kal Naismith struggling on the left. The long ball therefore became the main form of attack. This is not to say that long ball cannot be a valid style of play. But those long balls need to be measured passes rather than speculative punts forward. What we saw last night was more akin to “hoofing” rather than a methodical “long ball” approach. Were Millwall there for the taking? In his pre-match build-up Cook had stressed what a difficult trip it would be to the New Den, where Latics have a poor record. Millwall were playing a 4-4-2 system that sometimes looked like 4-2-4 as they threw players forward into attack. They repeatedly carved open the Wigan defence in the first half and their football was a cut above that of the visitors. However, in putting so many players forward there were going to be gaps left behind that could be exploited. But a Latics team lacking in pace, width and creativity was largely unable to capitalise on the gaps. Paul Cook has four centre forwards in his squad, who all need regular game time. With Will Grigg being injured he selected Vaughan and Windass, leaving Garner on the bench. 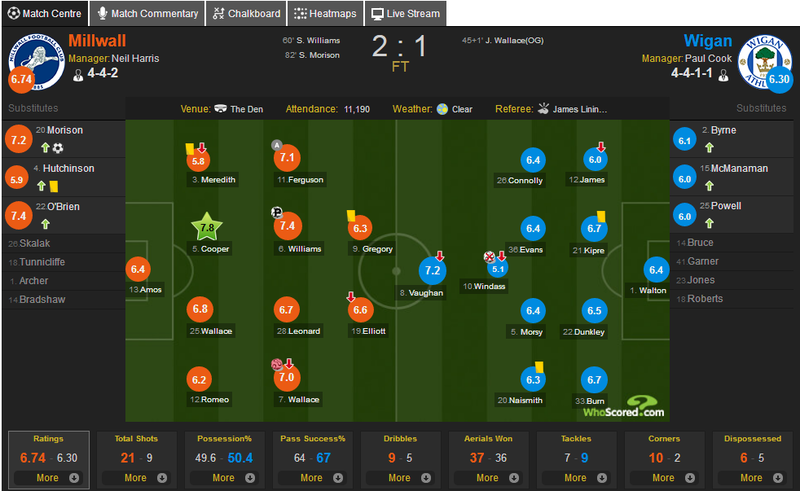 This was James Vaughan’s second league start of the season. Garner has made three league starts, Grigg eight and Windass one in the centre forward position. On his arrival from Sunderland in January, Vaughan had to play second fiddle to Grigg, largely being used as a substitute. The signings of Garner and Windass in the summer have made it even more difficult for the player to get a regular game. If Vaughan had been sharper, he would have scored in the 49th minute. But given his lack of game time he was not going to be at his sharpest. Vaughan had one of his better games for Latics last night, feeding off the few scraps that came his way. His work rate was as excellent as always. A left back to be signed in January? Dan Burn was again drafted into the left back position for the rested Antonee Robinson. Burn was given a torrid time by Millwall right winger Jed Wallace. It was a relief for Burn when he was moved into a back three in the second half. However, as things got more comfortable for one player they got less so for another. In the tactical reshuffle Kal Naismith was moved to left wing back. In the pre-season Naismith had a torrid time playing at left back, a position which did not suit him. Naismith does not have the tackling skills to be an effective full back/wing back. However, he does have a good left foot and a decent career strike record from wide midfield positions. Robinson is excellent going forward, but his defending can be suspect. If anything, his best position is left wing back, allowing him more scope to attack. Will Cook continue with his back line of three at Sheffield United on Saturday? Burn, Dunkley and Kipre make a formidable trio. With James and Robinson as wing backs Latics would have the width that they were lacking at Millwall. Another left back is a priority for Cook in the January transfer window.